While the Kurds once warmed to Moscow, it seems Ankara’s latest military operation in Syrian Kurdistan would have been impossible without the Kremlin’s agreement. Soldiers of the YPG, the Popular Protection Forces, in Kobane, Syrian Kurdistan. Photo (c): Pawel Pieniazek. All rights reserved. This Saturday, Kurds are celebrating the third anniversary of the battle of Kobane. In 2015, this city in northern Syria was surrounded by ISIS forces on three sides, with Turkey on its northern border. Turkish forces over the frontier were not keen on Kurdish volunteers relieving the city, and created obstacles for those who attempted to cross the border. Without the strong support of a foreign power, it seemed that defeat was inevitable. Yet over the course of the following three months, Kurdish fighters fought tooth and nail to defeat the ISIS insurgents besieging the city. The battle for Kobane also saw some of the first US airstrikes in the Syrian war. Victory came on 27 January 2015. It was a humiliation for ISIS, at a time when the terrorist group looked unstoppable. Islamic State had come up against the determined fighters of the People’s Protection Units and Women’s Protection Units, more commonly known as YPG and YPJ. Three years after the bloody siege, it seems that Kobane’s local administration is having second thoughts about celebrating the anniversary. The unease here in Kobane is palpable: I came here to northern Syria four months ago, during the last weeks battle for the ISIS stronghold of Raqqa. Demonstrations in the city are held on a daily basis — but this time they’re not about the victory of 2015. With ISIS no longer perceived as a major threat, Turkey has launched an offensive on the predominantly Kurdish region, or enclave, of Afrin in northwestern Syria. Ankara’s act appears to have taken place with the tacit acceptance of Russia and the United States. Syria’s Kurds were once well-disposed towards Russia — and after the Turkish attack, that goodwill seems in jeopardy. The Turkish army has called the attack, launched on 20 January, “Operation Olive Branch” — though this is far from a humanitarian initiative. Turkish fighter jets roared through the skies, supported on the ground by artillery units. Bombs have been dropped on US-backed YPG and YPJ forces by an army of a state that has been a NATO member for the past 60 years. A day later Turkish forces crossed the border into Syria itself. The goal of the Turkish military is to create a 30km-deep “secure zone” in the Afrin region. Turkish president Recep Tayyip Erdoğan has called the operation essential for both Turkey’s security and Syria’s territorial integrity. He also announced that the Turkish army intends to destroy all “terrorist nests”. Officially, the Turkish Armed Forces have declared the military operation to be against Kurdish military groups such as the YPG, which they consider as a branch of the PKK (Kurdistan Workers’ Party, considered a terrorist organisation by the EU and US). Surprisingly the Turkish military also announced that they want to defeat ISIS in the Afrin region — an odd statement given that the group has no fighters left in northern Syria. According to the London-based Syrian Observatory for Human Rights, since 20 January at least 122 people have been killed in the Turkish offensive, including 30 civilians. For his part, Erdoğan has publicly intimated that he “has a deal” with Russia over the fate of Afrin. When questioned about the Syrian Kurds’ accusation of Moscow’s betrayal, Russia’s presidential spokesperson Dmitry Peskov responded simply that he had “nothing to add” to statements made earlier. Moscow, the Kurds’ fairweather friend? A common view in the international press and on the streets of Kobane is that Moscow allowed Ankara to attack Afrin and use its airspace in exchange for permitting Syrian pro-regime forces allied with Russia to recapture Idlib province. The city of Idlib, 85km south from Afrin, and the surrounding region are controlled by Hayat Tahrir al-Sham, linked with Al-Qaeda, and other rebel groups. Some of them are supported by Turkey. In short, the goodwill between the Syrian Kurds and Russia has been destroyed. And it was some goodwill. The Democratic Federation of Northern Syria, as Syrian Kurdistan is officially known, opened a representative office in Moscow last February. The move which allowed Russia to demonstrate it had allies other than Bashar Al-Assad, and the Kurds to gain influence in any postwar peace deal. 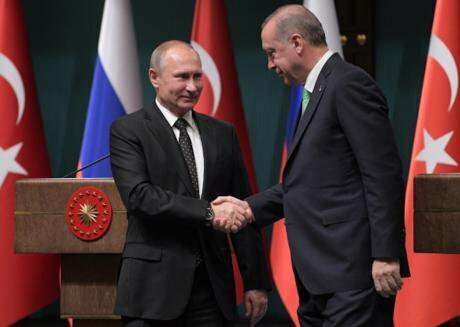 Vladimir Putin and Recep Tayyip Erdogan during a joint meeting on 11 December 2017. Photo (c): Alexei Druzhinin / RIA Novosti. All rights reserved. News also surfaced that Gazprom had received authorisation for the the second portion of the Turkish Stream pipeline, which the Russian energy giant hopes to bring online in 2019. Ankara granted Moscow a permit for its construction a day before launching Operation Olive Branch. This development coincided with a visit to Moscow by Turkish chief of staff Hulusi Akar and intelligence chief Hakan Fidan to Moscow on 19 January, during which the latter seem to have received a green light for the operation. At the time of writing, the outcome of that “productive” meeting is most keenly felt in Afrin — where shells are still landing. Nonetheless shells are also landing, now and again, in the Jazira region, the easternmost of the three cantons of autonomous Syrian Kurdistan. Some shells reportedly exploded near to the Kurdish capital of Qamishli. Though it’s calm here in Kobane, the atmosphere is nervous and tense. There are daily demonstrations on the streets in solidarity with the people of Afrin. The protesters burn Erdoğan’s pictures and shout “Erdoğan is a terrorist” even more than they did before. The local administration in Kobane has decided to move its offices for safety reasons — there are rumours that Turkey may target Kobane in the near future. Perhaps this is part of a psychological war: not to permit anybody in Northern Syria to feel comfortable. For its part, the Russian ministry of defence has avoided openly criticising Turkey’s military offensive. Instead, they blame the USA for having “exacerbated the situation” by arming the Syrian Kurds. 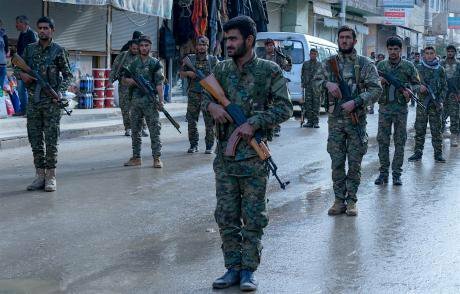 As analyst Anton Mardasov writes, Moscow wants to secure loyalty to Damascus from Syria’s Kurds, and is eager to punish them for prioritising relations with Washington. Among the Syrian Kurds it’s not hard to find people who doubt the USA’s intentions — locals told me on several occasions that Washington is not a partner they are willing to trust. The sad and painful experience of the Iraqi Kurds, left behind by the US in past decades, plays a role here. The consequences of the most recent painful episode — when Iraqi Kurds held a referendum on 25 September 2017 — makes that distrust even more potent. Some 93% of citizens in Northern Iraq voted for the independence of Kurdistan. The turnout was 72%. On 16 October, the Iraqi army took control over disputed territories which had been occupied by the Peshmerga in recent years, such as the oil-rich Kirkuk province. As both the Iraqi army and the Peshmerga are technically US allies, Washington decided not to step in. At the same time, the Kurds here have come to understand that the war in Syria has become less civil and more international. Without the strong support of global powers, it’s hard for them to remain important players. If the Free Syrian Army, for example, was left without a major foreign partner, local support for them would be marginalised. The remnants of the FSA finally got a small piece of territory only thanks to Turkish intervention in the Syrian territories between Afrin and Kobane. And now, to thank its patrons, this rebel group is taking part in the Afrin offensive. A general view of Kobane, Syrian Kurdistan. Photo (c): Pawel Pieniazek. All rights reserved. In contrast to the US, Russia appeared to the Kurds to be a trustworthy partner. “Once [the Russians] choose a group they stick to them and defend them,” one citizen of Kobane told me. While American officials have publicly mused about stopping support for Syrian rebels (most notoriously Donald Trump, after an SDF coalition of Arab and Kurdish militias recaptured Raqqa from ISIS), Russia never publicly voiced the possibility that it might stop supporting Bashar Al-Assad’s regime. Once it even seemed as if the Syrian Kurds would tighten their relations with Russia. The YPG coordinated their land operation with Russian forces in the east bank of Euphrates river in the Deir ez-Zor province which was confirmed by a press-conference. After years of failed peace processes, the Kremlin invited the Kurds to the Syrian National Dialogue Congress which is planned to be held in the Russian city of Sochi from 29-30 January. This was to have been the first Syria peace conference with the inclusion of the Kurdish representatives. Local officials from the Democratic Union Party (PYD), the most influential party in Syrian Kurdistan, saw the move as a positive step. The PYD hopes that Sochi may bring finally all Syrian groups to the table in search of peace. As soon as the Turkish military operation began in Afrin, PYD rejected their invitation. In Afrin itself, Kurdish relations with Russia were especially strong. After all, the Russian army has military bases there — shortly before Operation Olive Branch began, Russian troops left their bases and headed to territories controlled by the Syrian regime. In the meantime, the Kremlin continues to appealed to all sides of the conflict to act with restraint, underlining that Moscow supports the territorial integrity of Syria. This time, Russia does not want to cooperate with Kurds. 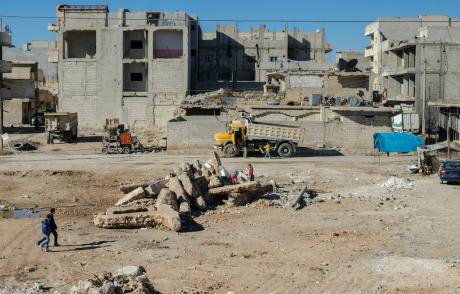 For now, it’s still quiet on the streets of Kobani. Once more, the Kurds have been left on their own – as they wait for the airstrikes.